In April 1947, still at the side of ruins of the Second World War, the members of the so-called “Liberal International” met in Oxford. 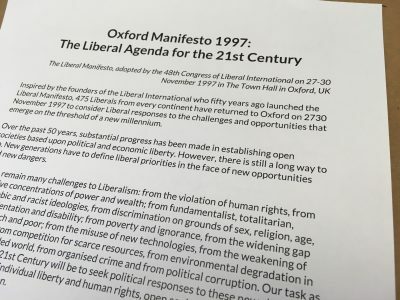 A solemn declaration emerged from the congress, then passed to the history of the liberals as the “Oxford Manifesto“. “The State is only the instrument of the community; it should assume no power which conflicts with the fundamental rights of the citizens and with the conditions essential for a responsible and creative life, namely […] The right to private ownership of property and the right to embark on individual enterprise“. 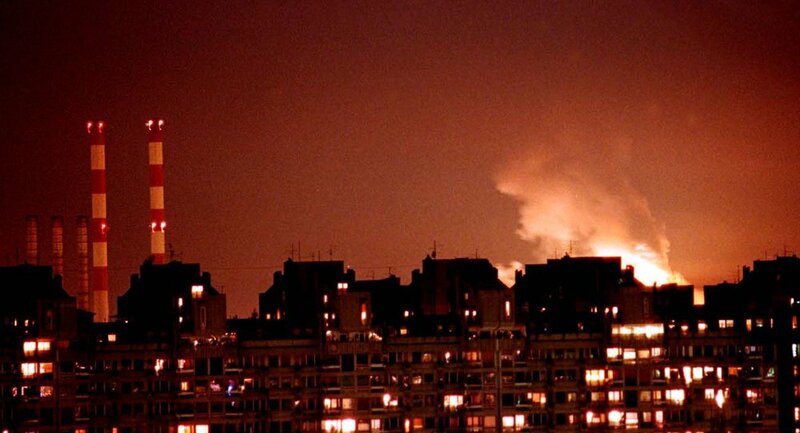 In 1997, it had not been a long time since The first Gulf War (August 1990-February 1991), but there was the smoking rubble of the Yugoslav wars and of the Western intervention in Kosovo. Such wars are examples of blatant connection between the interests of corporate industrial monopolies and the campaigns of destabilization and aggression of NATO Alliance, after the fall of the socialist bloc. This kind of political and economic world order followed the first bricks of neo-liberal construction of “free trade and competition on a world scale”. This has been reached also through evolution of those “international organizations” so dear to the liberal “manifestino” of 1997: GATT, WTO, IMF, World Bank, regional organizations such as EU, coming to the current partnership agreements, from Transatlantic to the Transpacific one. This ideological pillar, together with “destatization” processes, was one of the Oxfordian convictions: the free play of forces in an economic competition leads to growth, progress and political freedom. The “wealth of nations” of Adam Smith lies as a spiritual shadow in the background. This work was written by Adam Smith in 1776, when “his” nation, the English Empire, had already conquered – precisely through ruthless competition also by the means of economic sovereignty defined “protectionism” – political and military hegemony, maritime power all over the globe and especially above the others mercantilist competitors. From now on, in the free game of competition, the British economic power would have been hegemonic. When you are sure to be the strongest, you can play with open rules. Which growth, economic and political freedom peace have brought to the peoples these campaigns of liberalization and expansion of economic competition is history of today. We can see around the “free world” the rubble of war, the disaster of massive poverty, generated by what is perhaps the most serious and massive overproduction crisis with subsequent stagnation. Increased competition favors the survival of the strongest: monopoly corporations which are able to dominate and face the financial market. Through the “international organizations” and by the promotion of neoliberalism, the control on economy by State has certainly been weakened – up to the point of erasing it. It is the case of weak State members of regional organizations such as EU. Along this, almost indestructible foundations of an even larger Leviathan were built: International and Regionale Organizations full of sovereignty, Partnership Treaties, Military Alliances. All these were directly responsive to the business committees of private monopolies. They don’t need no more to control or to limit the State. They have “their state”. The sacredness of right to the individual enterprise initiative has ended up crushing the individuals in the grinding of competition, stealing them the freedom which they longed for. There is no single entrepreneur who is not, under a certain level, completely subject to financial powers or other larger monopolies. More importantly, free competition of production factors on a global scale has led to the almost total disappearance of political freedom, of sovereignty and right to self-determinate for States, peoples and individuals. In the present, political power relations produce pseudo-representative democracies in which minorities have no longer a voice, majorities enjoy a “dictatorship” (in the liberal sense of term, not in the Marxist tradition) ensured by disproportionate electoral prizes and barrier clauses that place in void the representativeness of millions and millions of votes. It becomes very difficult to affirm the existence of political freedom when over 4 million votes are often not enough to guarantee parliamentary representation. The excessive power of media mainstream and the strict rules for submitting an electoral application or candidacy prevent the growth of real opposition forces, disconnected from electoral cartels or concentrations of power pleasing to the real holders of economic, political and military force. In short, the paradise that free market had to guarantee was transformed into that hell that liberals wanted to romantically fight with an inexhaustible faith in individual. I wonder if liberals of 1947 Manifesto remembered (the memory was fresher) that their Italian colleagues collaborated with fascism at the time of its rise to power, becoming part of the first Mussolini government, continuing to support it, even after the release of the members of Popular Party, up to join the fascists, in the following elections, in a “big list”. This ones took benefit and power from antidemocratic award of “Acerbo” electoral law, which attributed to the list that had reached the relative majority (exceeding 25% of votes) a prize that allowed them to get the two-thirds of the Chamber’s seats. The “new” electoral law had been approved by the Chamber on July 21, 1923, thanks to the favorable vote of fascists, liberals and exponents of the Catholic right. Leaving aside representative democracies, we return to “human rights” argument, so dear to the mystique of the liberals. There is no era, like today’s, in which fundamental rights have not become expensive goods, even in the so-called “developed countries”. Indeed, especially in those. 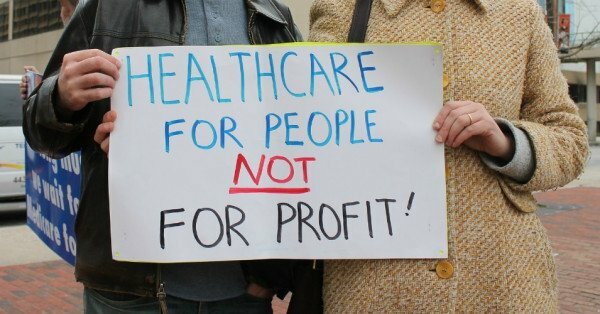 You have no right to live if you do not have the money to pay health treatments, you have no right to family if you do not have the money to pay for education, house and doctor for your children. You have no right to free movement if you do not have the money to move. Above all, you have no right to information, free culture and science. You do not have it absolutely – even you can pay – especially in western countries. It is really ungenerous to comment on paragraph dedicated to “The advance of Liberalism, 1947-97“. They speak about “the return of freedom and democracy to the former communist countries in Europe”, and today in many Eastern countries there are authoritarian regimes, if not openly fascist, like in Ukraine, Poland, Hungary, where the lack of respecting human rights and labour rights act as a lever to submit the working class and in general to erase social rights of whole Europe. It is not by chance that these regimes are supported by the western economic and liberal alliances. They talk about “the spread of democratic government and the rule of law”, and never as in the current era the respect of law and Constitution is seen as a nuisance, where it limits the economic power of monopolies, and it is remembered and utilized only when it is necessary to repress dissent. They note a “growing respect for human rights, both within states and as a subject for international oversight and – where necessary – intervention”, and never as in our time human rights violations are practiced in increasingly extended areas in the world, especially in areas controlled by or joined with the Western military and economic alliances (Israel, Saudi Arabia, Ukraine, Hungary, Poland, Turkey). The right of intervention is only practiced against the troublesome political and economic competitor for the Western world, often with fake charges of violations. A pitiful veil can be drawn up on considerations regarding “increased freedom of information, communication and travel, both within and across national boundaries”, or the “acceptance that shared responsibility within the world community extends to a common obligation to tackle world poverty and to protect the global environment”, misplaced arguments and non-existent circumstances just in 1997, when they can face with the disinformation perpetrated on the Yugoslav wars, and the exploitation of the third world and of the global environment. Returning to political freedom and representative democracies, I want to quote a reflection by an Italian essayist and mathematician, Piergiorgio Odifreddi, from his latest amusing script “Democracy does not exist“. Regarding the development of today’s political tendencies, the mathematician recalls the well-known paradox of the two ice-cream sellers, which also strongly suggests the relationship between freedom of economic initiative, competition and participation in social life. On ice-cream sellers, “their optimal arrangement, on a kilometer-long beach, should be 250 meters from the two extremes, so that no bather has to travel more than 250 meters to go and buy ice cream. But since the bathers located towards the extremities will go from the nearest ice-cream anyway, each of the two ice-cream sellers tends to approach the center to steal customers from the other, until the two are in the same position, with the possible consequence that bathers of the two extremes give up buying ice cream, if the distance from the center is perceived by them as excessive. “(P. Odifreddi, La democrazia non esiste. Critica matematica della ragione politica, p.18, Rizzoli 2018, Milan, Italy). The abstention of today’s bi-tripolar representative systems is now around stable percentages close to 30%, with occasional peaks that reach half of the voters in particular electoral events. In any case, the statistical trend is constantly increasing, even in those countries where voting is compulsory (figure 1). Even the recent Italian general elections saw a turnout of 73%: two points less than the previous elections in 2013, where 75.20% had voted. In this way, the true Leviathan has solved the problem of representativeness: the remaining voters concentrate their preference in the center, where you find people able to abdicate so much to their aims and interests for an ice cream. Odifreddi quotes Bertrand Russell, who noted that politicians can never be more stupid than their electors. Enzo Pellegrin is a criminal lawyer and a militant of the Communist Party in Italy. He usually writes on the website www.resistenze.org and on his blog “boraest” (www.boraest.com). Featured image is from Liberal International.